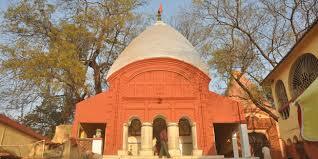 Here is Some Information about Nalateswari Temple(Shakti Pith) in Birbhum West Bengal India. 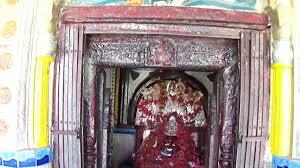 The Nalateswari Shakti Pith Temple is located to Nalhati town Near Birbhum West Bengal.The temple was renovate in 1890 Maharaja Ranajit Singha.The temple is Dedicated to Goddess Sati (Sakti),Nalateswari.Believed to be one of the 51 places where parts of Sati’s body fell. This temple is very sacred and visited by people coming from all over the country. 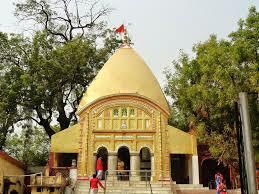 Since the throat or ‘nala’ of Sati is believed to have fallen here, it came to be known as the Maa Nalateswari Temple. 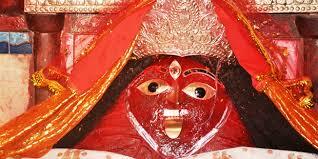 The main temple of the town is that of Maa Nalateshwari’s temple. She is believed to be present in a big mounted rock, dipped with vermillion, She is adorned with a gold crown and three golden eyes. She has a beautiful silver arch on her crown with the images of Maa Durga, Maa kali and lord Shiva. Special rituals are held here during the kali Puja and on Amavasya (new moon) with yagna and also on every Tuesday of the ‘Jaishtya’ (mid may- mid June) month of the Bengali calendar. On every Saturday, ‘aarati’ is done with 108 ‘pradeeps’ (lamp) of pure ghee. The history says that The goes beyond fourteen thousand years, actually it stretches since the dawn of the history, when Birbhum which is appeared as the part of the district was getting constituted with the inclusion of the tract known as the "Vajjabhumi” and "Rarh". During 5th century B.C there was the influence of Mahavira, their last great Tirthankara was prevailing in the country of Thunderbolt. You can say that during that time the country was rugged and wilder from every direction. Maurayan Emperor was gallantly ruling the territory or the “Rarhbhumi”. Many known emperor like “Harshavardhana”, “Shasankas” and “Guptas” was ruling over the whole area. The “Palas” and “Senas” are also forming a part of this kingdom after the dismemberment of Harsha's Empire. This “Rarhbhumi” was a place of Sant, Pir and Fakir, Nalateswari at Kalindipukur village was a place known for its simplicity. Presently this place is a carrier of many historical influences. This is one of the 51 places where parts of Sati's body fell thus it is known as Shakti peethas. The throat of Sati or “Nala” fell here as known by tradition on the other hand some people do believe that “Lalat” or forehead that fell here. There are all total 51 “Shakti Peethas” over which the temples were established all over india. Three such peethas namely “Kalighat”, “Kamakha” and “Nalateswri” are present in West Bengal. According the narration of several pre historic legends, the importance and origin of this place, resembles to the goddess Nalateswri temple. This is a raving legend which actually relates with the “Shakti Peethas”. The consort of lord shiva, goddess sati, felt insulted as her father, “Dakhs”, the king of mountains, haven’t invited shiva, (the lord of all gods and goddess) to the great fire sacrifice or yagna. Sati was unable to bear this humiliation, hence sacrificed her life in the yagna fire. The tragic turn of the infuriated events led to the bewilderment of Lord shiva. In order to pacify lord shiva, the creator of this world, lord Vishnu had decimated her body with his chakra (discus). This in turn had dispersed the pieces over the whole sub continent of India. And each of these sites has been developed into sacred places or peethas, manifestation of goddess. According to the localities, in 252th Bengali year or “Bongapto”, “Kamdev” (the Hindu god of love or desire) who had dreamt about its existence discovered the larynx of maa sati at this Nalahati forest. Another oral legend depicts that Ram Sharam Devsharma was known to be the first discoverer of “Nala” and this had marked the beginning of Maa Nalateswri devotion. In the later half, Bramhachari Kushalnan had offered the first “Bhog” or food offerings. He had started the salvation on the “Pancha-munda-ashana” or the five headed throne. Nalhati is a beautiful place with fine vicinity and plateaus all around it where Maa Nalateswri resides and has resemblance with Kamakha and Kalighat pithas. The goddess of this place is known as Maa Nalateswri who is also praised as Maa or “Bhagobidhata-Nalateswri” or Devi Parvati or Kalika. The orientation of this name came from pre historic story that narrates how the throat of Sati or “Nala” which one of the 51 parts of sati fell here as known by tradition on the other hand some people do believe that “Lalat” or forehead that fell here. So the name “Nalateswri” comes from “Nala” or throat of Maa sati. Within this natural beauty, the eastern side of the plateau provided secret formation of Nalateswri temple. Thousands of pilgrimage visits this place as a lot of peace and serenity resides in the minds of the worshippers. Nalhati which is the average elevations, situated in the tropics, comprising a climate of hot dry summers while cool wet winters, happens to be the birth place of rishi bankim chatterjee, is a beautiful conglomeration of nature , history and religion. Here, within deep forest, under the mysterious old banyan tree where the “Nala” of maa sati had dropped on this earth. By Road : There are many public and private vehicles available to reach Nalateswari Shakti Pith Temple Nalhati town Birbhum West Bengal . 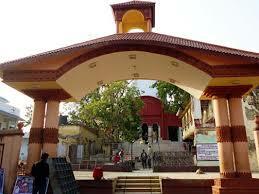 By Train : The Nearest Railway station is Nalhati station. By Air : The Nearest Airport is Dum Dum ,Kolkata Airport.